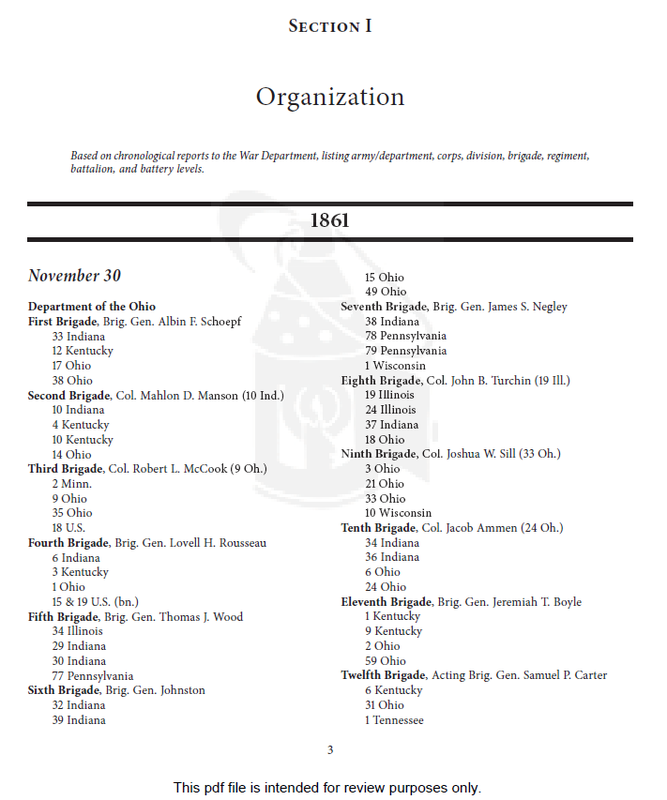 Collins, Darrell L. The Army of the Cumberland: Organization, Strength, Casualties, 1862-1865. (McFarland (www.McFarlandBooks.com), January 2019). 199 pages, orders of battle, notes, index. ISBN: 978-1-4766-7507-7 $49.95 (Paperback). 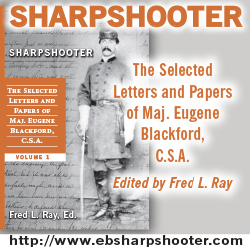 With The Army of the Cumberland: Organization, Strength, Casualties, 1862-1865, Darrell Collins has produced the fourth in a series of “Army” books for McFarland. His previous three books focused on the Army of the Potomac, the Army of Northern Virginia, and the Army of Tennessee. 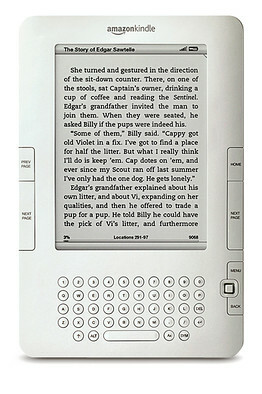 The format will be familiar to readers of the earlier books. Relying solely on the massive Official Records of the Union and Confederate Armies in the War of the Rebellion, Collins documents the Army of the Cumberland in three ways, its organization, strength, and casualties at various battles and other points in time. As I stated in my review on his Army of the Potomac book, using only the Official Records sees needlessly limiting. In addition, the diligent researcher can find all of this information free of charge online. That said, for the price, anyone remotely interested in the Army of the Cumberland will find this to be a very valuable reference book on that unit, all tidily organized and fully annotated. 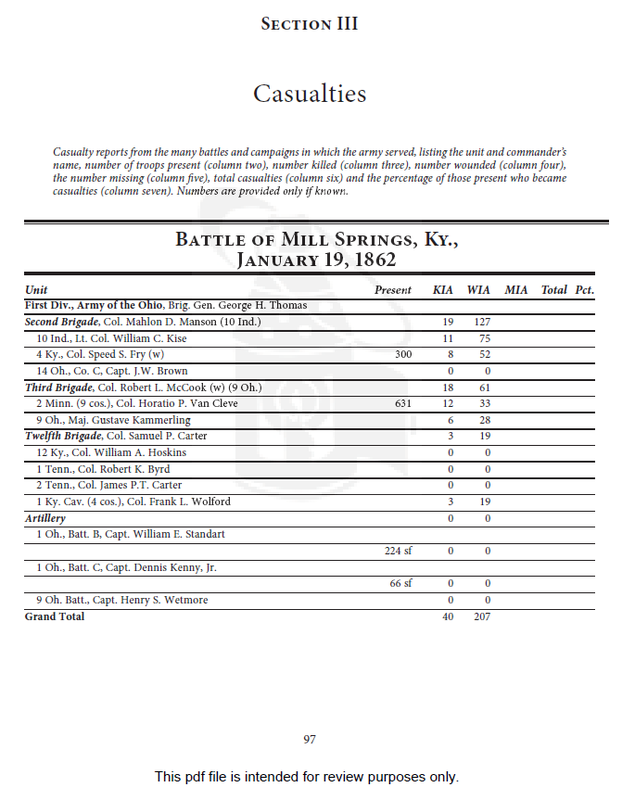 In addition, Collins created a Reference section showing every single order of battle or abstract return he found in the Official Records, noting the relevant Volume, Part, and pages for each. This makes it VERY easy to go look at the sources Collins used for yourself. The reference section essentially takes the place of a standard Bibliography. A commander index and unit index close out the final few pages by showing interested readers where to look in the book for specific leaders and units. 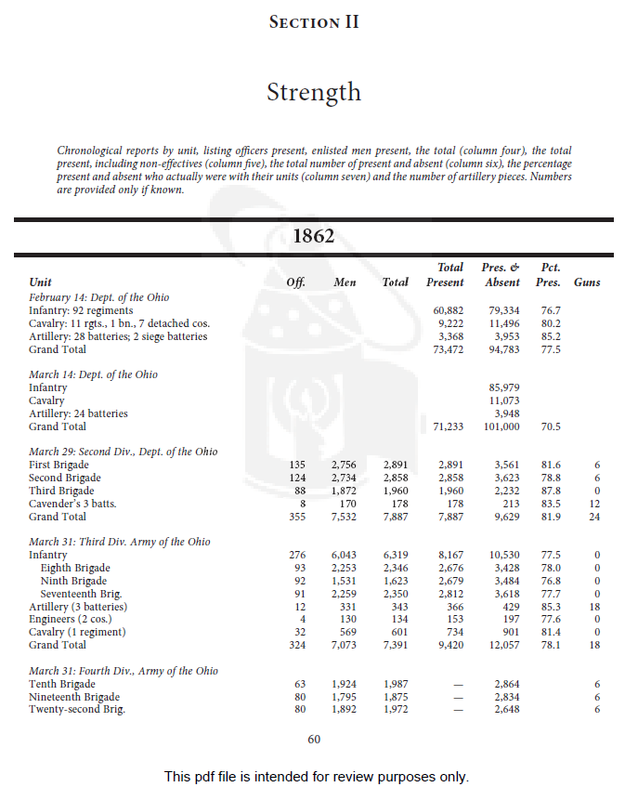 Strength, Casualties, 1862–1865 © 2019 Darrell L. Collins by permission of McFarland & Company, Inc., Box 611, Jefferson NC 28640. www.mcfarlandbooks.com. This section contains your standard orders of battle, divided by date. These are essentially the end of month tables of organization with which veteran readers of the Official Records are familiar. In each of these orders of battle, organization names are listed at the Department, Army, Corps, Division, Brigade, and even regiment/battalion/battery level. Leader names accompany all units. These are essentially the end of month abstract returns with which veteran readers of the Official Records are familiar. There are no leader names in this section, just strengths of individual units, which in this section generally go down to only division level for infantry and cavalry, but often go down to artillery battery level. While the lack of sources beyond the Official Records is disappointing, the book does offer value, even at the $49.95 price. The Official Records are freely available online in more than one location, so a diligent researcher could theoretically go through all 128 or so volumes and pull this same information, but the cost in time would be staggering. Collins offers readers an immense amount of information, all taken from literally tens of thousands of pages from the Official Records. If you are interested in orders of battle for the one of the main Union armies in the west during the Civil War, this is a reasonable price to pay rather than spending hundreds to thousands of hours of your own time looking for this information and compiling it on your own. 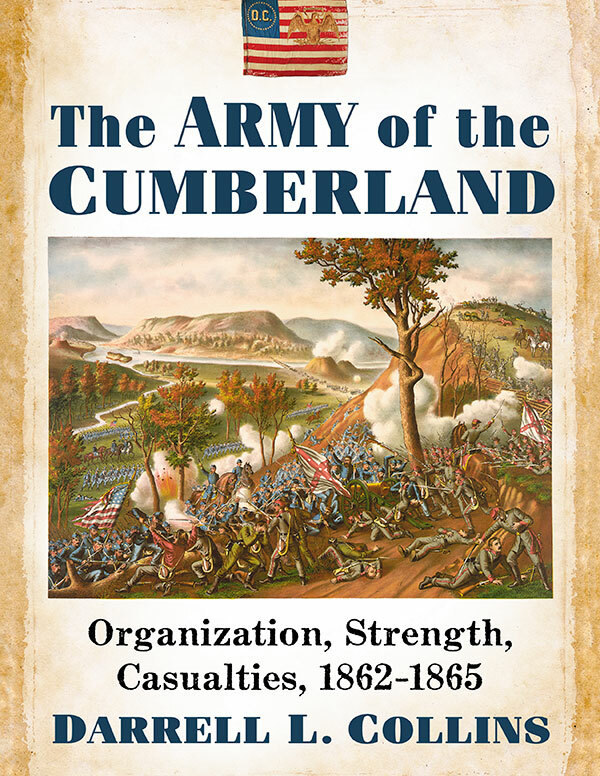 The Army of the Cumberland: Organization, Strength, Casualties, 1862-1865 continues Darrell Collins’ series of “Army of…” books published by McFarland. The format is very similar to the other books in the series, and the same insistence on using the Official Records, and ONLY the Official Records, continues. The price is a bit steep for a paperback book, but the sheer amount of information gathered in several useful formats makes this book an excellent reference work for students of the Army of the Cumberland. Wargamers will also find this book very useful when compiling orders of battle for historical and what-if scenarios.